Hummingbirds are one of the smallest species of birds, only growing 3 to 5 inches in length. 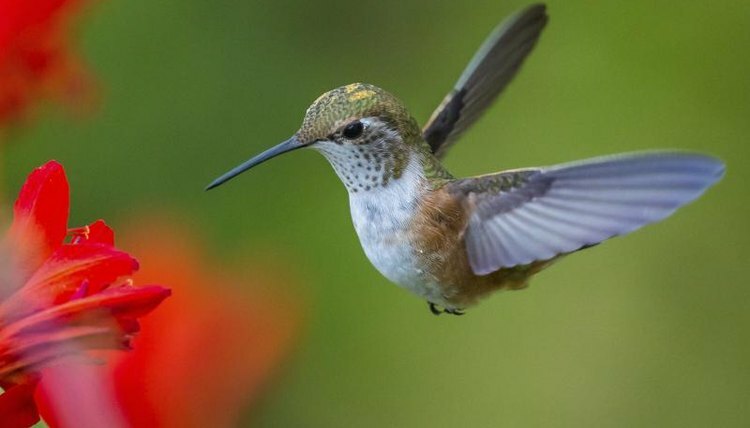 Vibrantly colored, hummingbirds are able to hover in mid-air by rapidly flaping their wings at speeds of around 50 times per second, according to Audubon. Although small in stature, many migratory species fly thousands of miles for hours at a time without resting. Despite the fact there are 328 different species of hummingbirds, their nesting habits are generally the same, even under varied ecological conditions. Breeding season begins between November and December, which is when male hummingbirds move into their breeding territories and females start constructing their nest, according to the University of Michigan Department of Zoology. The female selects a suitable nest site -- the ideal spot is typically on a downward slanting branch of a leafy tree or shrub, about 3 to 33 feet above the ground. Using her bill, the female builds a cup-shaped nest that is held together with sticky spider silk and lined with soft substances, such as feathers, plants or hair. To camouflage the nest, the female drapes the outside with dead leaves, bark, paint chips or lichen, so it looks like a natural-forming knob on a branch or shrub. Once the nest is finished, the courtship process begins. Male hummingbirds will perform a dramatic courtship dive to try and win over the female. The male flies around 60 feet into the air and then dives rapidly toward the ground, reaching speeds as fast as 20 to 60 miles per hour. During the downward dive, the male frequently makes loud popping, whistling and buzzing sounds. When the male begins to chase his desired female, she leads him to her nesting site. During copulation, the female spreads her tail and the male mounts her back. Copulation typically lasts 3 to 5 seconds. Within a few days after mating, the female hummingbird lays two white bean-shaped eggs, typically one day apart. The female and male have nothing more to do with each other after mating. For the next 14 to 19 days during the incubation period, the female will vigilantly guard and protect eggs from predators, rain and extreme heat from the sun. To further safeguard the eggs from the elements and keep them hidden from hungry predators, she'll often cover them with green leaves. The female will only leave her nest for short periods of time to forage for food, using safe routes that don't put her in any danger of not returning. After hatching, the eyes of the young hummingbirds are still closed. After five days, their feathers begin to appear and their eyes open. The female stays busy keeping her young warm, only leaving the safety of the nest to forage for food. Upon her return, she feeds the nestlings regurgitated food from her bill, such as pollen, nectar and small insects. When the young hummingbirds are able to leave the nest in 18 to 23 days, they're still dependent on their mother, but within two weeks become fully independent. The male hummingbird never helps care for the chicks.